There’s still just too much oil around, with physical traders reporting anything between 1.75 to 2.5 million barrels per day (bpd) of excess supply on the market. Only thing that’s changed is that anecdotes of a 3 million bpd surplus have declined, particularly so in Asia. That is a positive of sorts, but unless excess supply falls to around the 1 million bpd level – geopolitical risk premium won’t kick in like it used to before the glut took hold. He added that Iran needed to be among those countries “without a doubt.” The comments come as Iran has decided not to attend oil producers' talks in Doha on April 17. Tehran has called the idea of such a meeting daft. In response to the Saudi comments, Iranian oil minister Bijan Zanganeh told the Mehr News agency that the Islamic republic would “continue increasing its oil production” and exports. Meanwhile, a Reuters survey published last week indicated that OPEC’s oil production rose in March, after a period of stability in February, following higher production from Iran and near-record exports from southern Iraq. Its 4 million bpd-plus output was second only to Saudi Arabia among all of OPEC's 13 member nations. Lest we forget, Russian output remains at Soviet era highs of 10.91 million bpd. Simple truth of the matter is, the Iranians cannot flood the market and are highly unlikely to match their rhetoric of 1 million bpd, not least because they lack the infrastructure and means to do so in a short period of time, and were they to do so, the resulting price dip would come straight back to haunt them. The Russians have already said they'll look for “alternative means” to curb a production rise, but not by cancelling new exploration. In any case, they lack the means to ramp up output further. As for the Saudis, who still have spare capacity and are willing to freeze were others to do so, it is purely a case of meeting client demands. As the Oilholic has noted before, they are producing to a level that meets existing export demand for their longstanding clients. As such, they have no need to ramp up the output levels. So phoney chatter of “will they, won’t they” is purely for market consumption and has little connection with reality when it comes to net volume additions or declines, something which would be dictated by market economics! As for what this blogger expects would come out of Doha – probably an agreement big on public relations spin than a real-terms cut. For argument sake, even if there is a cut of 1 million bpd, the reprieve would be temporary. Futures would rise over the short-term before the reality of tepid demand and considerable oil held in storage triggers another round of correction. Get used to the $40-50 per barrel range. That’s all for the moment folks, keep reading, keep it crude! © Gaurav Sharma 2016. 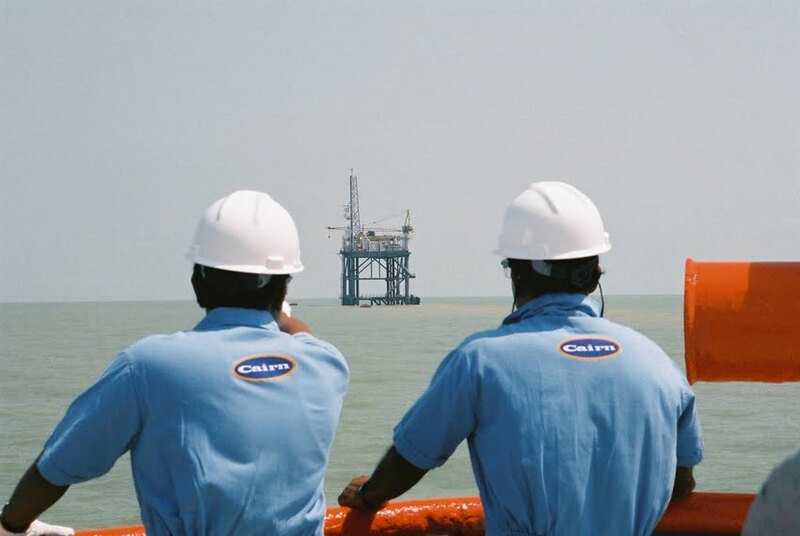 Photo: Offshore oil exploration site in India © Cairn Energy.